Anyone who has ever stared at the accursed cursor blinking on the blank page of a computer screen knows how frustrating the writing process can be. But there are those who dedicate their lives to it, and all of the joys and frustrations that come with it. "We fill our journals and write our novels and take our writing classes. We read voraciously, marveling at the sentences and characters and plot twists our favorite authors bestow upon us. How do they do it? we ask ourselves. And why?" 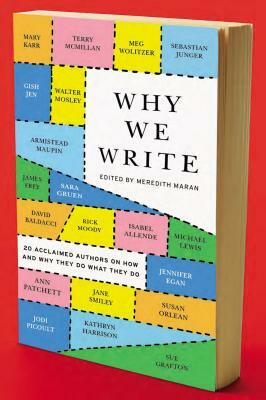 This is the question, or set of questions, that editor Meredith Maran set out to answer in Why We Write: 20 Acclaimed Authors on How and Why They Do What They Do, though ultimately the collection answers many more besides. The twenty authors here, all successful and known to the literary community, offer a wide array of voices, adding the voices of contemporary writers the canon of Hemingway, Miller and Kerouac quotes on writing that grace the pages of Pinterest these days. They write because they have to, because there is an itch there that needs to be scratched ("The only thing that makes me crazier than writing is not writing." -Sara Gruen). They write in an attempt to answer important questions about the world ("The unwritten sentence--perhaps that will be the one, the one that makes life comprehensible, the one that reveals the beauty & order under what can sometimes seem like a landscape of chaos and cruelty." -Kathryn Harrison). They write through the uncertainties of the publishing industry. They write through their own insecurities. Is the last book I wrote my last book, they all seem to wonder? Will I run out of ideas? Inspiration? Words? Time? Focus? Will my next book be successful? Will anyone read it? Will they like it? Most entertaining in Why We Write is the chance to go behind the pages of the books we know and love--or perhaps, the pages of books as-yet unknown to us--to meet the authors that gave them to us. What we find there is often surprising. Sebastian Junger recalls the number of readers astonished to learn that he was 5'8", having imagined him to be 6'3". "What was it about my book that made me tall?" he asks. Do we really know the writers we love so much? we wonder in response. Ann Patchett notes her adversity to writing rituals and habits, noting, in her characteristically dry way, "When you're a writer, it's so easy to become a freak." Why We Write is a collection that can be taken piece by piece or read as a whole, sorted by author or genre or age at the readers' whim. Some writers seem to reveal themselves with a chip on their shoulders. Others veer so strongly from taking their work too seriously as to seem flippant. Some talk of the challenges of racism and sexism in the publishing industry. Most talk of the utter shock they first felt when realizing that their words were printed and bound and available for the world to read, and the struggle to balance writing with the rest of their lives, and the need to keep writing even when the writing is not going well. Why We Write is on sale today from Plume. The twenty writers included in Why We Write, in alphabetical order, are: Isabel Allende, David Baldacci, Jennifer Egan, James Frey, Sue Grafton, Sara Gruen, Kathryn Harrison, Gish Jen, Sebastian Junger, Mary Karr, Michael Lewis, Armistead Maupin, Terry McMillan, Rick Moody, Walter Mosley, Susan Orlean, Ann Patchett, Jodi Picoult, Jane Smily, Meg Wolitzer. Note: Thanks to the publisher, Plume, for providing an e-galley of this title for review via NetGalley. This sounds like the perfect "for the writer" book gift. Also thanks for including the list of authors. It definitely is - and also for avid readers. Really interesting stuff! gonna touch the problem, especially with properties under chapter 11 bankruptcy.